I'll be showcasing the Winter Wonderland DSP for the week. Here's my card for tonight, the first shaker card I've made & I'm pretty happy with it, although I've probably gone a little overboard with the sequins - not like me at all hehehe! I've made this one for the in laws. 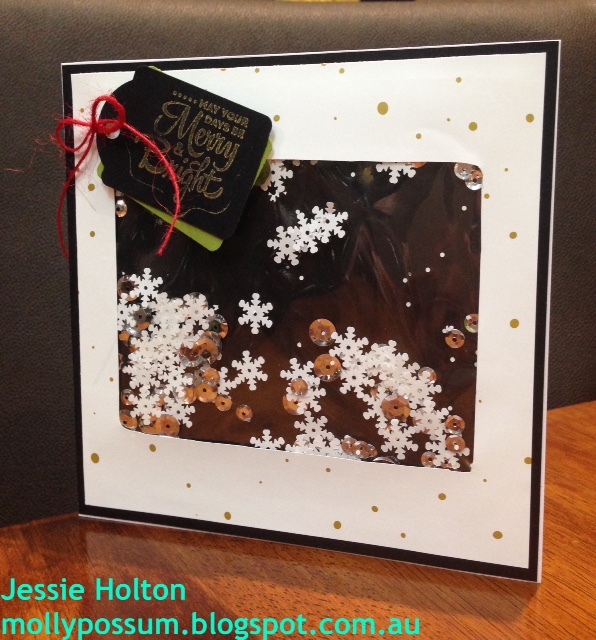 I've used the Winter Wonderland Specialty DSP, backed on Basic Black card stock & a Whisper White card stock base. 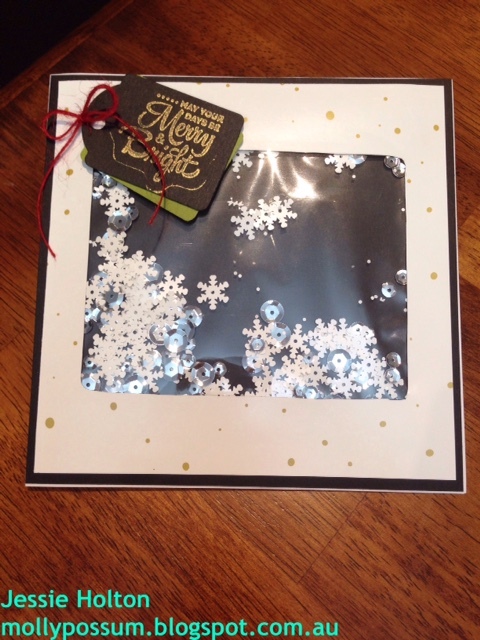 The shaker part is filled with the Frosted Sequins Embellishments in a Cello Bag. I've used the Gold Ink to stamp the sentiment from the Lots of Joy stamp set (I've also used the "Wishing You Lots of Joy" stamp from this set inside the card, in Gold ink). I've used the Note Tag Punch in Old Olive & Basic Black card stock for the sentiment & the red string is from my stash. Here's a list of the products I've used. Remember to use my December Hostess Code 3JKG26HJ when ordering so you get extra goodies from me!! I hope you've enjoyed this first card in the series. Please check back to see my other cards over the next few days & definitely check back on December 20 6pm as we are doing another BLOG HOP!!! So exciting!! Can't wait to show you all the new products! !